Typically, there are three steps involved in proceeding with Neurofeedback therapy. First, we would meet for a 60-minute initial assessment. During this time I will gather a comprehensive history of your symptoms and problems. I will review your medical records, if any. In the end I will be able to offer you my diagnosis and recommend a treatment plan, which may or may not involve Neurofeedback. Or, if further clarification is needed, I might request additional records, suggest some testing or refer you for a consultation. At this point, if Neurofeedback treatment seems indicated we will schedule the QEEG recording. The cost of the initial assessment is $175. The code that insurance companies use for this procedure is CPT 90791 or 90792. Next, the QEEG assessment will allow us to see the exact extent and locations of your brainwave anomalies, if any. I use LORETA (Low Resolution Electromagnetic Tomography Analysis) as a standard part of my QEEG analysis. You will receive your brainwave maps and a comprehensive report describing the findings. The cost of the QEEG assessment is $700. The two codes that insurance companies use for this procedure are CPT 95816 and 95957. Finally, we will start Neurofeedback treatments on a once- or twice-a-week basis. We’ll be teaching your brain to fire in a new and healthier way. It takes a while for the brain to learn this new pattern and to be able to hold on to it. Most people are able to accomplish this in 20-40 sessions. I offer my clients two payment options: 1. $150 per session if you pay as you go; 2. $135 per session if you pre-pay for 20 sessions ($2,700), with subsequent payments remaining at the $135 per session if more sessions are needed. The code that insurance companies use for this procedure is CPT 90901 or 90876. As I described in the previous page (PRACTICE), your insurance may or may not cover all or parts of the costs. Consulting your insurance company about their policies on Neurofeedback (or simply Biofeedback) can be an important part of planning the financial aspects of your treatment. Below is the list of published Neurofeedback studies compiled by Dr. Hammond in 2007. Since then approximately 70-100 new studies have been published every year. Neurofeedback (also called Neurotherapy or EEG Biofeedback) is a computer-assisted treatment that enables you to alter your own brain waves. When you can see your own brain waves on a computer screen, you can learn to change them in a direction that improves your brain functioning. Thus, the goal of Neurofeedback is self-regulation. Biofeedback has been used to help people control their physiological responses, such as relaxing their muscles, increasing temperature in their hands, lowering their heart rate, reducing sweating, promoting heart rate variability and normalizing breathing, to name a few. Neurofeedback, which is a form of Biofeedback, employs brain-computer interfaces and virtual reality settings to allow brainwave training. From a behavioral viewpoint, Neurofeedback is a form of operant conditioning. Once you have conditioned your brain to increase or reduce specific brainwaves (Delta, Theta, Alpha, Beta, Gamma) or to improve the symmetry and coherence of those brainwaves, you can improve your brain functioning in areas such as attention, alertness, mental acuity, memory, flexibility, associative thinking, creativity and calmness. Such mental conditioning or “physical therapy” for the brain improves your “mental posture” and rids you of cognitive problems, just as improved physical posture and muscle tone can rid you of back pain. EEG Biofeedback has been shown to be particularly beneficial in ADD/ADHD, traumatic brain injury, stroke, epilepsy, depression, alcoholism, Chronic Fatigue Syndrome, brain Lyme, sleep disorders, anxiety, pain control, headaches, stress reduction, autoimmune disorders and other conditions in which brain wave properties are either impaired or not at the optimal level. How can one treatment modality address so many different conditions? Because it addresses the source, by fine-tuning the central command unit - your brain. In general, the goal of Neurofeedback is to normalize irregular brain wave patterns. For example, research shows that people with ADD or ADHD have 30% more slow (Theta) brain wave activity when performing cognitive tasks than normally found. As a result, they constantly seek out stimulation by daydreaming, fidgeting, talking a great deal and rapidly switching their attention from one activity to another. Stimulant medications, such as Ritalin, are helpful by artificially increasing their level of brain activation and temporarily relieving symptoms. Neurofeedback is a drug-free and side effect-free solution that teaches people to increase brain activity as needed, alleviating symptoms and often eliminating the need for medications. Of course, different treatment protocols exist for different conditions and consist of selecting appropriate brain wave frequency, amplitude, synchrony, coherence, direction and location. QEEG (sometimes called "brain mapping") can significantly increase the accuracy of treatment by pinpointing the exact location of abnormal brainwave activity. Comparing pre- and post-treatment brain maps allows easy evaluation of treatment effectiveness. Neurofeedback training is a painless, non-invasive procedure. One or more sensors (small gold-plated electrodes) are placed on the scalp, and one on each ear. 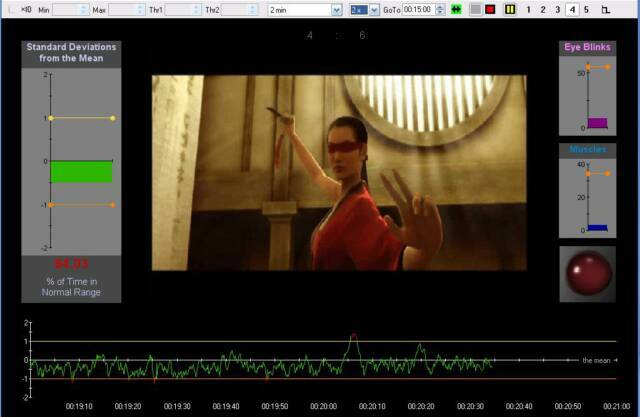 The brain waves are recorded and displayed on a computer screen by means of a video game (e.g., bowling or darts) and a sound signal. The patient is asked to make the video game go… with her brain! 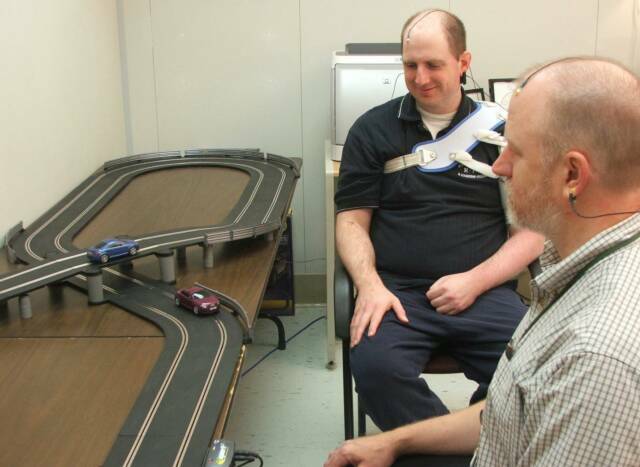 An exciting innovation in Neurofeedback training is the ability to move actual objects, like the slot cars. As activity in the brain shifts in the desired direction, the car moves or the video game progresses and the player scores. If activity in the brain doesn’t change, or increases in an adverse direction, the game stops. Gradually, a learning of new brain wave patterns takes place. A person learns to engage the desired mental state depending on the demands of the situation. For example, when a child suffering from ADD is given a test in school, he might be able to shift into a highly attentive state (like flexing the right muscle) by recalling and engaging the mental state he has learned to capture in his training sessions. Numerous studies have demonstrated that this learning is durable and reliable years after the treatment. Some doctors prefer to call Neurofeedback a training rather than a treatment, because the emphasis here is on developing self-regulation. Instead of relying on a “treatment” given to them in the form of pills or surgery, patients learn to gain control over their own mental states. From this perspective, Neurofeedback is similar to other disciplines of self-regulation, like Yoga, meditation and Chi-Gong, where a person learns to control his or her body and mind. Neurofeedback training is a learning process, therefore results are seen gradually over time. For most conditions, initial progress can be seen within about ten sessions. Most patients meet their treatment goals in 20-40 sessions, depending on their condition. Each session lasts approximately 50 minutes, which includes the hook-up, homework assignments and discussion of session-to-session progress. Z-score Neurofeedback is one of the latest scientific advances in the 50-year history of Neurofeedback. It incorporates a large normative database in the computer program that serves as a reference of normal brainwaves. It shows instantly and continuously how your brainwaves compare to the normative database that consists of nearly a thousand healthy individuals. The results are presented as Z Scores, or Standard Deviations from the mean. In the example above, an individual’s brainwave amplitude at the location where the sensor was placed is significantly below the mean. This indicates abnormally reduced brain activity (Beta waves in this case), which is likely to be the cause of the symptoms. The computer displays a continuous stream of information (feedback) about your brainwave (neuro) status, hence neuro-feedback. After 30 sessions the same individual was able to increase amplitudes of his Beta1, Beta2 and Beta3 waves to normal levels. How do you increase or reduce your brainwave activity? Brainwaves are never still, they go up and down depending on minute fluctuations in your mental state. Most of these fluctuations are so quick and fleeting that we are not aware of them. But once your brainwaves are made visible to you, you may start noticing how their movements relate to your mental states. E.g., if your brainwaves dipped way below the mean perhaps you momentarily tuned out, or drifted off, or got preoccupied, or distracted, or may be you were trying to focus too hard. Try to change your mental state (your mental posture) and see if your brainwaves changed too. You may also try changing your physical posture or breathing pattern. On the other hand, if your brainwaves moved closer to the mean, try to take note of this mental state and remember it. Rather than wrestling with your brainwaves, allow the feedback to guide you and to tell you when you are in the “zone” and then try to stay there. Just like improving bad physical posture may help you get rid of back pain, improving your mental posture will improve your brain functioning and thus reduce the symptoms. In this regard, neurofeedback acts like a mind mirror. 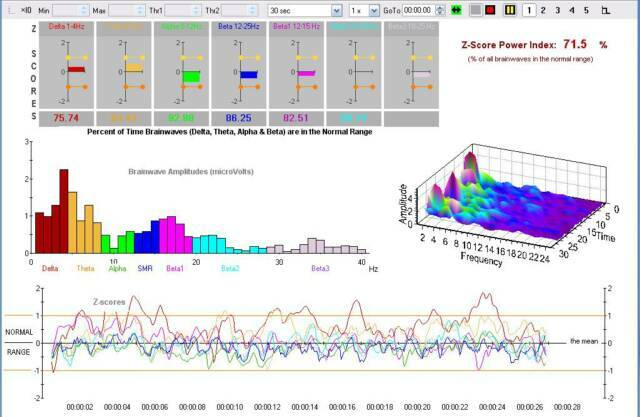 Z-score neurofeedback not only shows you your brainwaves, but also tells you where they should be for optimal functioning. Because we do not have direct access to our brainwaves, learning to control them is not as easy as controlling muscles or breathing. For most people it might take 5-10 sessions to feel some sense of control, and perhaps another 10-20 sessions to learn to do it reliably and consistently. Remember when you drove a car for the very first time? You probably were all over the road, and it took you a while to learn to stay in lane. 1. It’s a good practice to keep a daily log of the symptoms you are trying to improve (e.g., distractibility, mental fatigue, anxiety, depression, moodiness, headaches, insomnia, etc.) using a simple 1-10 point rating scale. 2. Another important way to track your progress is to get input from people who know you well (family, teachers, co-workers, friends). 3. As your treatment progresses, the change in your brainwaves will be measured and your session-to-session progress will be charted. 4. Finally, repeating the QEEG at the end of the treatment would clearly show any changes in your brainwave patterns.